ELLE Pleated Trench Coat: Should I Get It? 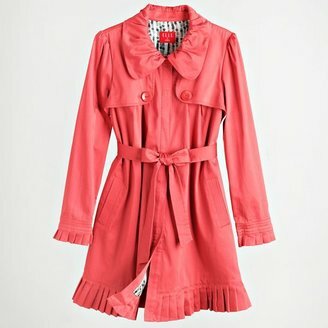 Some assistance please: Earlier this week, I spotted this bright coral trench by ELLE for Kohl's online (see product pic above). I thought it looked good as featured in their spring lookbook, so today I decided to check it out in person—and it's actually really cute in person (I think). The fabric has a nice sheen to it, the adorable collar frames the face nicely, and the pleat detailing along the cuffs and hem adds a subtle, chic touch. Overall, this trench fit me well and the color brought a smile to my face (despite the crummy lighting in the photo above). The problem with this trench is that it's very lightweight, so it may not be warm enough for oftentimes chilly (and rainy) March weather. I'm also not loving the price, it's still over $50 on sale. What do you think, would you wear something like this? Should I get it or wait for something better to come along? I love the color, but the buttons are a bit much. The color and details are cute, but it seems bulky around the middle. I'd keep looking. i agree about the middle. the details are nice- pleats, collar, puffed sleeve (i'm such a sucker for puffed sleeves) but if it's not useful then i wouldn't pay full price. i'd wait to see if it goes on sale and possibly clearance. i got a 3/4 sleeved trench coat on sale at old navy last year and while it's nice, the 3/4 length sleeves are proving to be almost entirely useless. my lower arms get really cold. if it was further reduced or on clearance i probably wouldn't have felt as bad about buying it. That's why I don't find it particularly flattering. The middle is way too bulky. And I think it's too expensive for an item that won't even keep you away from the chill. not a fan of the trench, its too expensive for what it is. however, love your bag! whered you snag that one?? I have been debating whether to get the same exact coat! I opted out, because I get cold and don't feel like spending that much money to still remain uncomfortable. I also didn't get it because I have two pet papillons and didn't want to get their white hair on the black color, and don't like pink- although now that I see the pink on, it looks very cute. I think you should get a Kohl's promo code (they are having another BIG sale) and go get the coat. It's a great and UNIQUE color for you. Coral/Peach looks good on Blondes. Also, I love the pleating. This is a spring coat though...just know that. But it won't be cold forever BB. I agree with Mary Hall, find another discount or coupon and buy it! This kind of styling (& color) is usually only seen in Anthropologie but definitely not at that low a price. the buttons + the belt make it look like you have no torso. long legs... but no torso. I don't think you should buy it. You do look lovely in it, but why spend over $50 on something that you are unsure about? I only buy something if I am absolutely sure that I really love it, and would definitely wear it. It's a very pretty coat, and a lovely color - but last summer I bought a baby pink trench by Bebe and have probably worn it all of 5 times because it has been too cold. I personally love it. But the price is a tad high for something that might not do its job (keeping you warm). Wait awhile, Kohls always puts their stuff on clearance. no. you look so wrinkly. I don't know if I'd be willing to pay so much for something that is just okay. I love love the color but those two buttons are too big or in a weird spot or something. I was just at H & M last night and they have a lot of cute trenches in... You should go check it out first before you decide on this one! It is darn cute- I like the Elle line at Kohl's. I think it looks great on-but the price is a tough one! The coupon idea is a good one! tell us what you decided! It's adorable ... but you're right, it won't get much wear if it's super light. I'd skip it, BB. When I buy something like a trench, I look for classic shapes. This isn't it. But if you are looking for something trendy, this is cute although I personally do not like the pleats or the buttons (too cutesy). The color makes it enough of a statement. I agree, its a little too trendy and not flattering. I'd wait for something you love!! I love that color! It's perfect on you. :o) But if you're unsure about its practicality you should wait till it goes on sale and then decide whether or not you really want it. If, after all that time, you still want it, then I'd say go for it! It might work really well for those summer evenings when you need a sweater or wrap (even here in California). I would wait, especially since the price is a little high. I bought the same coat this past week & LOVE it...I did not get the "cranberry" which I too thought was a coral, but looks more like a soft orange, not light enough to be called coral...love the color, but it does not love me...I got the black and am so happy, no regrets ...while it is still cold here in Northern CA I plan to wear it with a turtleneck sweater...but it will be great for most of Spring and then again next Fall. It runs a bit big, so try it on.I normally take a 4/6 so a sm. and ended up with the xsm ....They were selling them really fast...the cranberry/coral was sold out on line so I ran to the store and they only had two left in that color so....do not wait too long if you want it...It has to be all about the LOVE , if you LOVE it, then it is a must no matter what any one says. I love that, I'm definitely getting me one (even though I already have something similar). I really need to stop! Thanks to everyone for the awesome feedback (can I take you all with me whenever I go shopping?!?). For now I think I'm gonna pass on the coat, see if anything better comes along! It's not flattering and will go out of fashion in a snap. If you want to drop some cash invest in a classic. Easily found at GAP or Banana Republic. Hell, even Old Navy occasionally has some good trench coats. You're a gorgeous girl, get something that fits properly. The fabric looks a bit cheap, and the gathering in the middle does you no justice! I'd suggest looking at H&M for a good trench. I bought one 2 years ago in NYC for $50.00 and I always go back to it, season after season. They carry a varity of colors, and many in waterproof materials... always a bonus! SUPER CUTE! Def a must buy!!! Unfortunately the fabric is more shiny in real life but I still like it! I think this is VERY cute on you. I love empire waste jackets on petit girls like yourself. Imagine how chic this will look with some amazing turquoise accessories! It may not be a warm jacket, but I think you will get loads of use out of this through the spring, summer and fall months. I’m all for this purchase. I saw this coat in a magazine and went to the store just now to buy it. The orange/red color is a bit off though once you see it in-store. They didnt have my size anyway, so i bought it in black and I adore it. Plus its on sale so I got it for $53!